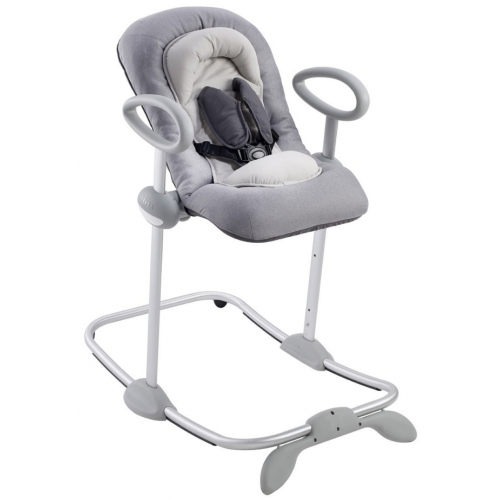 The Beaba Up & Down Bouncer is a modern bouncer with adjustable height. In one click and just a few seconds, adjust the bouncer to one of 4 heights thanks to the patented UP & DOWN system, adjustment by simple push-button. Then with only one hand, change the seat’s reclining position, choosing one of the 3 positions available. With a total of 12 possible positions, you can adjust the bouncer according to your activities and share every moment of the day with baby who can relax, observe and participate fully in all activities around him. The high position allows to relieve parents’ backs. Thanks to its detachable head hugger (for use from 0 to 3 months) which provides optimum support, baby can use the bouncer from birth. Its soft padded seating provides excellent comfort for baby. The Up & Down bouncer is also highly secure. 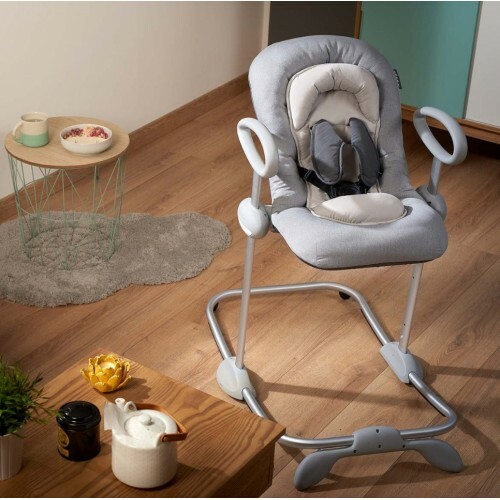 It has excellent stability, a rocking lock and 5-point harness, allowing baby to be lulled in complete safety. 3 Reclining positions: backrest adjustable with only one hand. Maximum safety: 5 point harness. Soft seat for greater comfort and fully removable for ease of care. Genuine newborn insert: ergonomic and very comfortable for the newborn. Integrated head hugger for optimal support. For use from 0 to 3 months. Rocking function with integrated locking system: for safety when rocking baby. Transport handles: easy to transport from one room to another. Optional Play Arch available in a range of colours. Product maintenance: removable cushion and newborn support, hand washable at 40°C max.